From the inside looking out, your screen door allows you to enjoy the fresh air while protecting your home from bugs and other pesky intruders. From the outside looking in, it could be the first thing visitors see when they arrive and the last thing they see when they leave. Because of its value and importance to your daily life and enjoyment of the outdoors, keeping your screen door in tip-top shape isn’t an option. It’s a necessity. So, if you find your screen door is damaged, faded or not gliding along its tracks as well as it should, don’t come unhinged. Door Pros has the repair and replacement services you need to screen out your worries—for good. 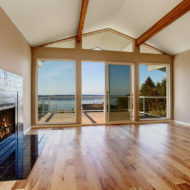 At Door Pros, we’re proud of our work and are convinced you’ll be proud to show it off in your home or business. That’s why, when you trust our experts to replace or repair your screen door, you can count on us to do whatever it takes to ensure your satisfaction. 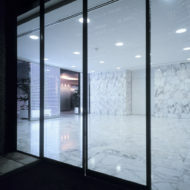 Plus, at Door Pros, we provide a replacement that will last for years to come and includes a 10-year warranty option! Adds eye-catching appeal to your garage with the choice of a white, brown or sandstone frame. In search of the perfect partner to expertly add a pet door to your screen door, making life easier for a four-legged family member? Door Pros has the expertise and can hook you up. 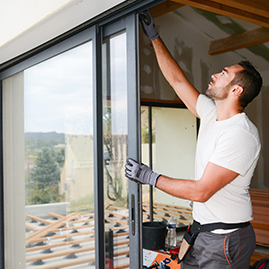 Whether you’re looking to replace or repair your screen door or you’re interested in adding a screen door to your garage door, slide on over to Door Pros. We’ll gladly answer all of your questions. We’re the leading screen door experts in the Coachella Valley towns of Indian Wells, Palm Desert, La Quinta and Rancho Mirage. Give us a ring today!